Ever since a disaster dinner the other night, I’ve been thinking of adding this new category to the blog. I didn’t want to depress anybody but on the other hand, sometimes misery loves company. Two nights ago I had a total culinary meltdown. Normally I try out a new dish just on R. and I tweak and fiddle with it alone, and then eventually invite friends over to grade it. But the other night we had our friend Rob over (who designed and set up this blog) – and he and R. sat in the kitchen, all of us talking, as I attempted sweet potatoes from Ottolenghi and Tamimi’s Jerusalem: A Cookbook. 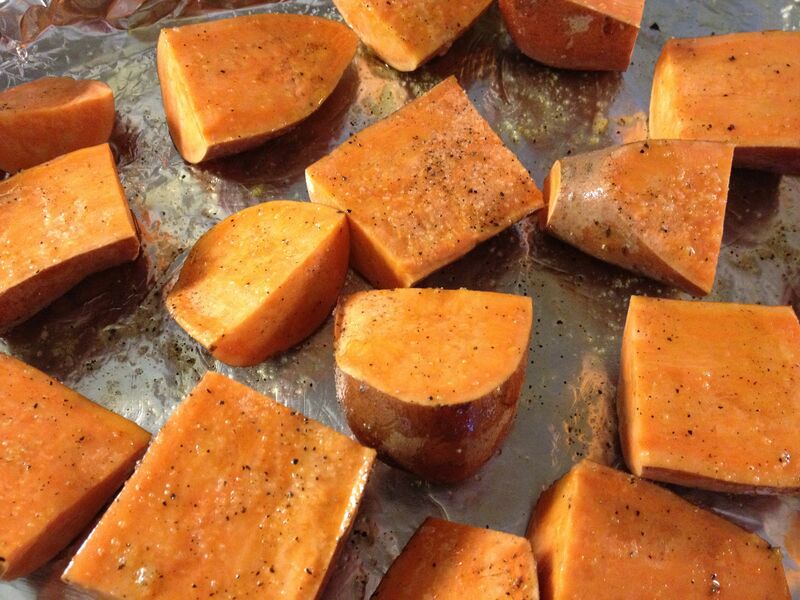 Really, how hard can sweet potatoes be? As it turns out very hard, literally so. I had one piece you couldn’t get a fork into, while other pieces were soft and perfect. A reduction sauce and chilis and scallions were involved, and I could tell how good the dish was supposed to be, but it was sabotaged by the occasional rocklike piece of potato, not to mention the total calcification of the reduction sauce. And then there was the roast salmon with onion, orange and fennel which required broiling the vegetables after they roasted – including the sliced orange – at the last minute. One major problem was getting the broiler turned on for the first time ever, like in fifteen years, which was a fairly terrifying process. In the end, nothing tasted very good, certainly not the salmon, roasted oranges etc. And as I dished up the dinner I realized that except for a tiny bit of arugula, the entire meal was orange. 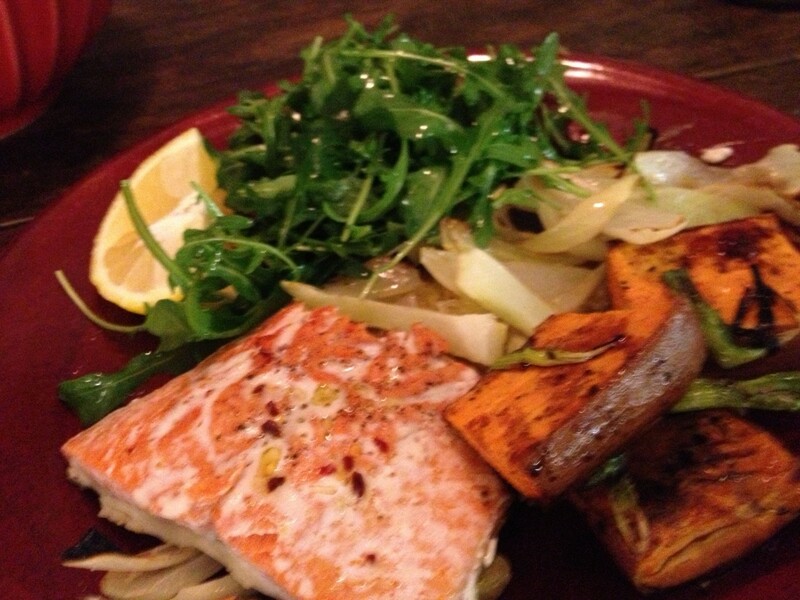 Sweet potatoes, salmon, and the actual orange itself. This experience (not unknown to me in the past) renewed my intent with this blog to come up with recipes that are delicious and allow you, the cook, to not go through what I just went through with the Orange Dinner. My biggest cooking disaster was during my ‘tween years. These were the days before microwaves and toaster ovens. I was trying to help my mom by heating up some corned beef. I’d never used a double boiler before. So I put some sliced corned beef in the top of the double boiler and added water to it. I placed the bottom of the double boiler underneath and set it on the heated stove burner. The problem was, the water was supposed to go in the bottom of the double boiler. So not only did I boil the taste out of the corned beef, but I also managed to melt the bottom of the double boiler so it was no longer usable. Enough years have passed so that I look at this disaster as “go big or go home.” I’m almost proud that I managed to ruin both the pan and the corned beef at one time. Pretty funny, Barbara. Orange is the New Black… and at least it wasn’t that: black. I’m sure it was delicious. My mother was the best when I was young and learning to cook. I once forgot the chocolate _and_ the baking powder in a chocolate cake. “Never mind,” she said. “Just whip some cream and we’ll put it on a fancy plate. No one will notice.” And they didn’t. Thanks,Sarah. But alas,it really, really wasn’t good! Well, it looks lovely, you do have an eye! Have you considered painting? I’ve tried and was about as successful at it as with this dinner. One hot August night, I stuck the electric rotisserie in the workroom next to the kitchen, so as not to heat up the kitchen. I could hear it churning around in there when our guests arrived. When it came time, I trotted out to the workroom to retrieve my nicely rotisseried chicken. Not! The electric connection was loose, and had fallen out. A cold, clammy, pimply-white chicken was turning around and around. We sent out for pizza. My first attempt at homemade bread resulted in dinner rolls that didn’t rise. Cooked them anyway hoping for a miracle. One guest wandered into the kitchen, sampled the disaster from the pan before I could throw them away, and declared them hard, but tasty. He insisted–the others politely chimed in–that I serve them anyway. I’ve had an oven version of that disaster. Was so sure I had turned it on, but not. Ah those are real friends! My worst cooking disaster ended a friendship. One of my children’s babysitters came to visit in between her second and third year of law school bringing her fiancé along for a delicious home cooked meal. The meal was home cooked but not so delicious. You had to sip water just to get the chicken down your throat it was so dry. They left before dessert. We never heard from them again and were not invited to the wedding! It’s become a family joke that if you need to 86 someone from your friend list- serve them my chicken! These recipes sound too complicated for me. Reduction? Um…. If I had a cooking blog, it would have to be called The Lazy Cook. Sometimes when I get ambitious, I make a ridiculous mess–like when I decided I would make a dairy-free cheesecake out of a concoction of cashews and blueberries. I had to pureé bit by tiny bit in the blender because I didn’t have a food processor and I got so tired if it, I forgot to put the lid on the blender for one batch. The cheesecake was delicious, but my kitchen looked like the scene of a blueberrry murder. Denise – And the subtitle for The Lazy Cook could be the Blueberry Murder. This was the second time in my life I tried a reduction sauce and it truly turned rock hard.